I headed back to Bay Ridge today for a couple of reasons. First, there are many more bars there just calling out for a visit and Bar Man has a tough time turning down an invitation. 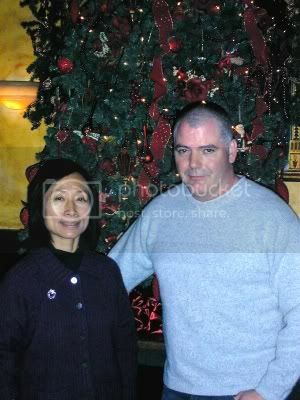 Secondly, the Mysterious Chinese Woman wanted to take a friend out for dinner and became intrigued by my write-up of Henry Gratton’s and so that is where she decided to go and I then joined her. More on that will follow. Located on the corner of 84th and 3rd is this interesting place. It is decorated in a kind of frumpy basement recreation room style complete with over-stuffed maroon sofas covered with throw pillows. Table lamps sit on end tables between the sofas and there is a small Christmas tree decorated with white lights sitting on one of them. In front of the sofas are coffee tables in various sizes and shapes, one of which had a couple of chairs around it. The other ones might have chairs around them at other times but they were currently pulled into a semi-circle in front of a sofa in the back. Apparently this is where the young mothers in the neighborhood gather for wine and conversation. I say young mothers because they all seemed to have one or more young children with them. It added a bit of a strange ambience and I did kind of feel like I was having a drink at my aunt’s place or something. 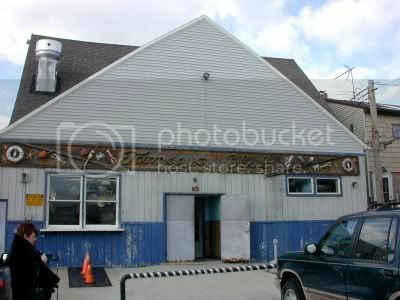 Half windows with dark blue curtains on the brick wall opposite the bar kind of added to that basement look. There was a disco ball hanging in the back and from the looks of the lighting they probably have live music or DJs at night. The bar itself had a hammered copper top with a wood paneled front and a black footrest. There are two brass T shaped beer stations with a total of seven spigots. The bar chairs are dark wood with dark cloth seats. There are two large mosaics of martini glasses behind the bar made up of dark blue glass and pieces of mirror. Quite classy. Between those is a glass shelf of liquor above that a stained glass circle with an “M” in the middle. 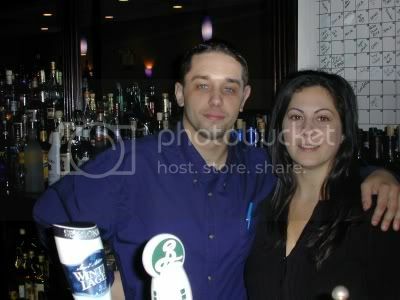 A rack of wine and martini glasses hangs over the bar and it is decorated with a strand of little red and green lights. The chef and manager were having a conversation about adding a new drink to the menu. I think they settled on something with a shrimp in it. Oh well, I have had them with raw oysters so how bad could this one be. I settled on something a bit more mundane, a Dewar’s and soda. Down the street a bit at 7912 3rd Avenue is this was a classic Irish bar with a tough old broad tending bar that cursed like a sailor in a rough voice. My kind of woman, and she looked so classy wearing a white lace shawl. I would have liked to have taken her picture put she didn’t look like the type that would pose. There is all kinds of stuff in here, old tubas on the wall, dozens of metal beer serving trays, the kind you don’t see any more, mugs and small pitchers hanging from the ceiling opposite the bar and a large blowfish hangs over the area behind the bar along with four stained glass lights. Three crenulated milk-glass lights hang over the bar and they give of a yellowish glow. The old bar has an inlaid wooden top with most of whatever finish there might have been worn away. It has a dark, almost black, paneled front and a black footrest that gets narrower towards the back. The walls in here are brick, where you can see them behind the stuff hanging on them. They are largely covered with pictures, shelves of knick knacks, and an occasional mirror. Behind the bar there is a small boar’s head and a larger one next to an antique breakfront. There is a bust of Groucho Marx and one of Napoleon (two great comedic talents) sitting on top. There are plain shelves on each side of the breakfront that hold the booze. They are just starting to decorate for Christmas but there already plenty of very large ornaments hanging over the bar. Be sure to check out the cigar store Indian in the front of the place. There is a refrigerator with a glass door in the back that is full of beer. Groucho’s brothers, Chico and Harpo, sit on top. Across the street from J.J. 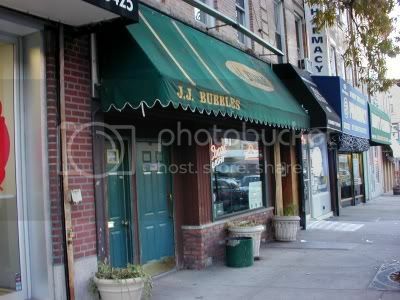 Bubbles and on the corner of 77th and 3rd is another Irish bar. This one is wider than usual and has room enough for a shuffle board table, although it is smaller than the ones you find in old bars in Northern Minnesota. Interestingly enough there is a cigar store Indian in here too. I assume someone must have gone door-to-door selling them at a really good price. I wish he had come to my neighborhood. The two long walls in here are brick. The front wall and a small section of the wall opposite the bar is white plaster with windows with small wooden-framed glass panes. The back wall is half white plaster and half wood paneling. The windows up front are brightly decorated with small white lights and large wreaths decorated with white lights and red bows. 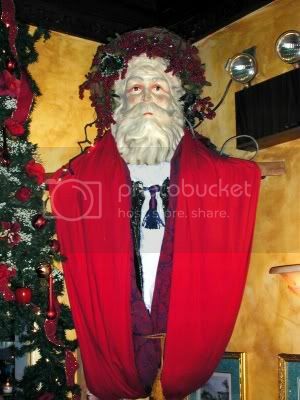 There is a well lit wreath and dangling white lights above blackboards advertising drink specials; eight 7oz bottles of Budweiser for $10 and a pitcher of Blue Moon Belgian White for the same price. There are also a lot of police and fire department patches mounted on the wall. There were four televisions going in here, two showing news and two showing soccer. I had a pint of Staropramen, a beer brewed in Prague, and a shot of Jameson. From here I headed back to Henry Grattan’s for dinner, and what a dinner it was. From the spinach salad with walnuts and cranberries through the assortment of appetizers (mussels prepared two ways, shrimp, clams, a cheese fondue) to the dinners (I had a Gaelic steak, delicious, the Mysterious Chinese Woman had lamb chops and there were no leftovers, and our friend had a shrimp pasta dish made special because she doesn’t care for anything spicy). We finished it off with a chocolate concoction topped with ice cream. The chef in here, Martin, came over and chatted with us. He wanted to make sure I said he was the one who put up the Christmas decorations and that Barry was just holding the ladder for him. We ate our dinner under the watchful eye of Saint Nick, so we had to be nice. The dining area is every bit as cozy as the area up front with the bar and there was a cheerful little fire in a fireplace back here. It really did have the feel of eating in someone’s private dining room. A most enjoyable evening and I would gladly come back again and bring more friends. 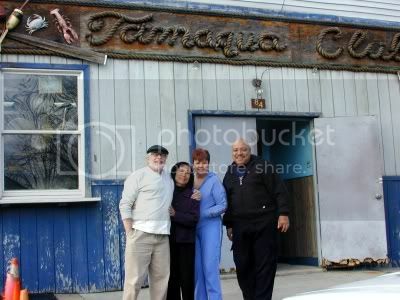 As I mentioned last week, when Bernie and I were in Bally Bunion a fellow recommended that we visit his home bar, the Tamaqua Club. at Gerritsen Beach in Brooklyn. It was a good recommendation as you will see. 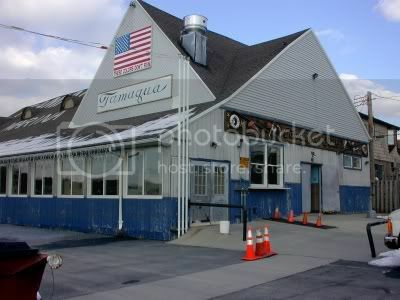 This was a classic waterfront bar and clubhouse that has been around forever, or at least since the 1920s. It doesn’t look like it has changed a lot and the people in here seem to like it that way. 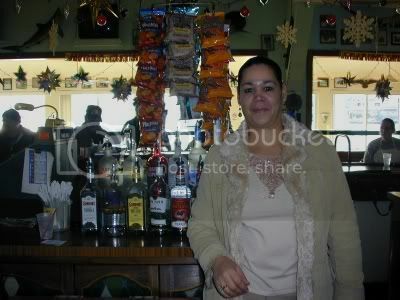 It is a large place that has the feel of an old VFW or American Legion club. And I don’t mean that in a bad way. Too many of these old clubs feel a need to remodel and a lot of what made them fun somehow seems to get lost. When you walk in here you really feel like you have stepped back in time and certainly stepped out of Brooklyn. 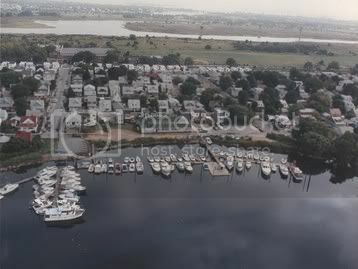 It is right on the water and there is a active marina right in front. One of the guys drinking in here lives part of the time on a boat docked right outside. There is a square bar with a black rippled linoleum top with a narrow wood armrest in front, a wood-grained Formica front, and a black footrest. Seating is a combination of old wood bar chairs and bar stools with well worn, torn and taped seats. There are three beer stations on the bar, two on one side and one on the opposite side. They each had two spigots so not much of a selection, but they did have a Sam Adam’s and some kind of an Amber Bock. The bartender works inside the square bar where there are two wooden cabinets that have green and white diamond patterned stained glass doors. Sitting on top of them are two tiers of liquor and metal racks of little bags of potato chips and, Bar Man’s favorite, Cheese Curls. They do have a kitchen in here but nobody seemed to be eating. Maybe it is more of a dinner place. They seem to host a lot of events here and do have live music on occasion. There are a couple of pool tables at one end and a foosball machine up against the back wall. Tables and chairs and benches pretty much line the walls and occupy most of the free floor space. 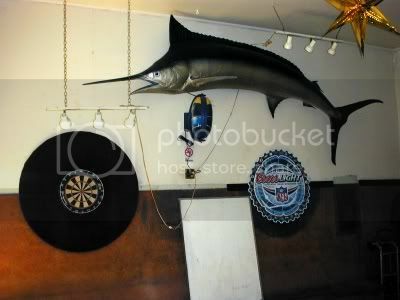 There are all kinds of mounted fish on the walls along with photos of the regulars, many of them proudly displaying their catch. All of the people in here seemed to be regulars, but very friendly. One fellow showed me around the place and gave me a quick run-down of the neighborhood and how much he liked it. I can see why. By the time we left we all felt like regulars too. The wall next to the water has large glass windows so you can sit and gaze out at the water and the boats. It doesn’t look quite the way as it used to, a bit grimier with more grit, but still has the flavor of an old fishing town. If someone just plopped you down here you would never think that you were in Brooklyn. I had a few Amber Bocks and shots of Yukon Jack (beers and shots seemed to be the thing to drink) before calling it a day. I will be back though when summer rolls around. Today I hit the last of the five boroughs of New York City, Staten Island. It was a fairly nice day for a boat ride, but we did stay inside instead of hanging on the rails to watch the Statue of Liberty go by. If you visit New York you really should take the ferry, it is free and you can just get off at Staten Island and then get back on the next one to Manhattan. You get great views. We were escorted by a Coast Guard boat with machineguns fore and aft. First time I have ever seen that. This is a steak house with only a hanger steak on the menu. To be fair, it was there lunch menu. The dinner menu did, indeed, offer a lot of steaks including a porterhouse, one of my favorites. There is a decent sized bar with a marble top and a polished dark wood armrest and front. A brass rail and wood bar chairs with mustard-yellow seats. A matching wood bar back with shelves for liquor and glasses and coolers with glass doors that were full of beer. Tiered shelves above for liquor with one section full of a good selection of bottled wines. There is a fairly large espresso machine at one end. Large mirrors are behind the bottles. Stubby blue tubular lights hang over the bar. The walls are pale orange above wood paneling. Dark blue half-cone shaped lights hang on the wall opposite the bar towards the back along with a couple of Christmas presents. Brown booth-like benches line that section of the wall with tables covered in white tablecloths in front of them. There are more tables in a wider section of the room across the way and these have little green flying saucer shaped lights hanging over them. 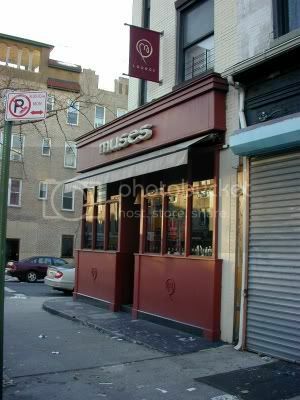 There is a large upstairs party room with a small outside area that offers a nice view of downtown Manhattan and Brooklyn. The bartenders said sunsets with the light reflecting off the buildings are quite beautiful. 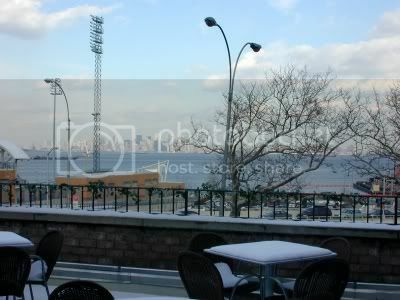 This place is quite close to both the ferry terminal and the ballpark where the “Baby Bombers” play. It seems like it would be a very nice place to stop in for a drink and even dinner before or after a game. I may very well do that one day next summer. On this somewhat chilly day I had a Dewar’s and soda. As the name implies, this is a fairly small bar on a small side street. 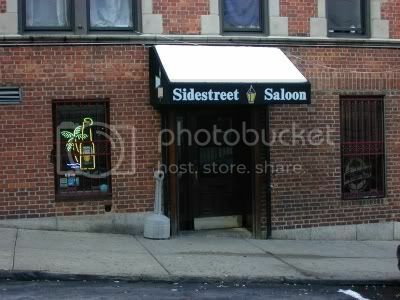 The bar is U shaped and wraps around a square brick column with shelves of liquor on the back corners. The bar is old wood with a brass rail running around it. The bar chairs are high-backed dark wood. The back side of the bar has a door leading to the kitchen and next to that are more shelves of liquor and a metal overhead rack of glasses. A bit of an overhang above the bar (more like a lowered section of the ceiling) has recessed lights and is decorated with a garland of pine and small white lights. There is a decent sized dining area with brick walls and a large Bass Ale mirror. Behind where I was sitting was a large mirror, a Fire Bird II jukebox, a television, and a System Megatouch game that seemed to cycle through snippets of lots of video games. My favorite was air hockey. 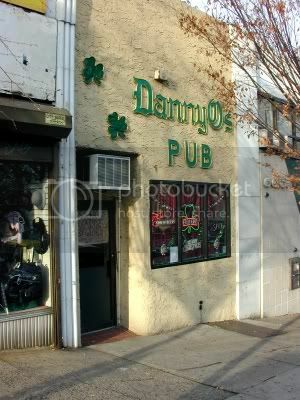 This was an Irish pub where everyone, except the bartender, was speaking a language other than English, and it wasn’t Irish either. It sounded like either Swedish or Norwegian. A bit strange. There was a nice wooden bar with a bit of a curve to it at the end by the door. There was a variety of seating at the bar, at my end they were old wooden chairs with high curved backs and seats padded in torn and taped brown leather-like vinyl. This, apparently, was a family owned bar with the old guy tending bar being one of the owners. It was quite dark in here but well decorated with wrapped presents, plastic Santas, and strings of little white lights. This could safely be put into the dive bar category what with a pretty standard bar back and stacks of boxes of unrefrigerated Almaden wine ready for your drinking pleasure. A cold breeze laced with cigarette smoke blue through every time the bartender stood in the doorway having a smoke. Actually that wasn’t too bad because it masked the slight smell of urine that seemed to pervade the place. The foosball machine was, mercifully, in the front. I had a bottle of Magner’s Cider served in a glass that wasn’t all that clean. A somewhat small bar tucked into the end of a fairly large dining area. The bar itself was comfortable enough with high-backed dark wood chairs in front of a bar with a brass rail. Several beer stations each with two spigots sat on the bar. 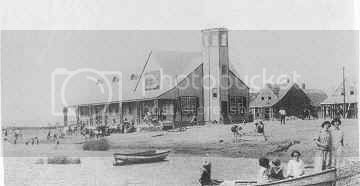 As you might gather from the name, it has a somewhat nautical look to it with a ship’s wheel and a picture of a Clipper ship on the wall. Lots of multi-colored lights were strung above the mirrors behind the bar that had tiered shelves of liquor. Not too much to see here but just a neat little place to pop into for a quick drink. The sun was just setting as I headed back to the ferry and the sunset was, indeed, quite spectacular. The buildings in lower Manhattan had a bright golden glow to them that was really beautiful. 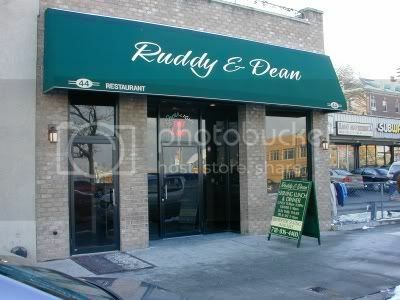 This just reinforces my intentions to come back to Ruddy and Dean on summer evening for drinks on their deck. A very pleasant, although chilly, day with four bars hit making 978 for the day and leaving 22 more for the year. 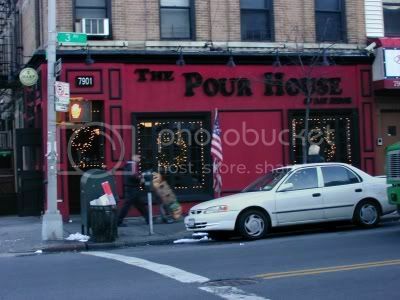 And I have now had a drink in at least one bar in all five boroughs of New York and several in Long Island as well. Queens is the borough just adjacent to Brooklyn with a bit of a non-specific boundary. At least few people seem able to agree on exactly where the boundary between Queens and Brooklyn actually lies. It lies somewhere beyond Williamsburg, that’s all I know. I got there by subway and I know that where I got off was, without a doubt, Queens. 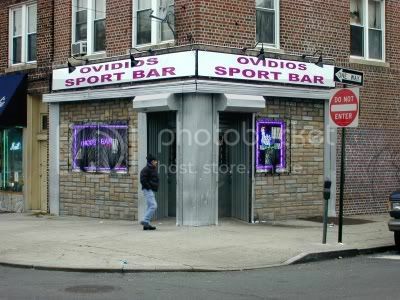 This was my first bar in Queens, on 65th and 39th, one block off Roosevelt Avenue, but it might just as well have been in another country. Not a person in the place, including the bartender, spoke English. Luckily the bartender did understand the word “Budweiser.” It is universal. When I asked how much it was I got a glass. There were old wood shelves and coolers with wooden doors behind the bar and a tiered shelf of liquor sitting on top of that. The bottom tier was lit from behind with a blue light giving bottles of vodka and gin an eerie glow. White plaster arches and columns with interesting raised patterns surrounded mirrors that had a strand of purple Christmas trim draped above them. There was a sign on one saying “Trago Pedido – Trago Pagado.” If someone knows what that means let me know. There was an overhang above the area behind the bar with a fine metal grate that had purple florescent lights above it giving it a bit of an other-worldly look. There were two televisions on the wall above the windows in front showing the Spanish version of Fox sports. Interestingly, Fox is also the name of the Mexican president. Small tables with red table cloths and green vases with red flowers sitting on them lined the wall up by the windows and the wall opposite the bar. The wall opposite the bar is wood paneling above which are mirrors. Half circle red lights hang on the mirrors and on the back wall. There are also some plastic Santa Clauses and white balloons hanging on them. There was also a large illuminated snowman sitting up front. I had a bottle of Budweiser served with a little napkin wrapped around the top, just like you get them in Mexico. I passed on the glass and just threw a $10 bill on the table to find out how much the beer cost. It was $4. I had to wander a ways before I found another bar that was open. Kind of surprising because this just looked like a stretch where there would be a lot of little bars that would be open all day. 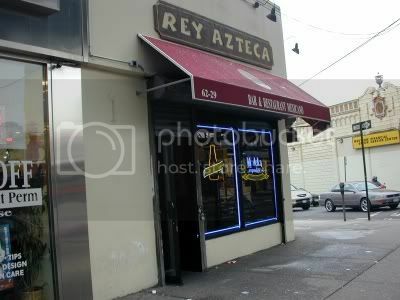 It was a nice enough Mexican bar and restaurant with a Venezuelan bartender. 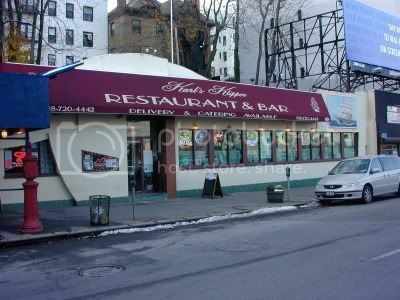 The large windows on two sides that look out on a gray Roosevelt Avenue and a lack of heat in the place when I walked in let you know you weren’t in Mexico though. There was a nice wooden bar with a clear plastic top that covered Mexican currency, bills and coins, and pictures that looked like they were torn from Mexican magazines and newspapers. There was a silver foot rail and black bar chairs. The bar back was kind of plain, just wooden shelves of glasses and tiered shelves of liquor and their selection of bottled and canned beers. They did have quite an extensive selection of tequilas. There is an overhang above the area just behind the bar tiled to look like the roof of a hacienda. Above that was a multi-colored mosaic embedded with beer bottles. There were also a number of small mirrors with wide wooden frames hanging on it. The floor was a nicely patterned tile. The walls were yellow above wood paneling. 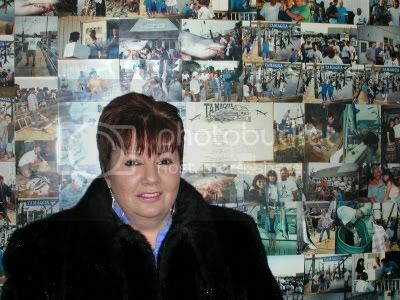 On the wall to the right of the bar is a large framed Mexican flag behind glass. On the back wall and the portion of the wall opposite the bar that didn’t have windows were large heavy looking plaster wall hangings with a variety of Mexican designs. There were lots of little tables with tops that looked like distressed copper. I had a margarita, on the rocks even though I asked for it up. It wasn’t very good, made with one of those sweet mixes instead of fresh limes. On the bright side, the heat was turned on and it was quite cozy by the time I left. A pretty decent day with two new bars and one new borough hit. This makes 974 bars for the year and leaves me with 26 more bars and one more borough for the year.